A variety of plants thrive in the coniferous forests of Canada, Europe, Asia and the United States. The plants rely on the forests’ snowy winters and warm summers to thrive and grow, providing shelter and valuable food sources for wildlife and birds. For native people, the plants also provide a wealth of critical resources including food, clothing, medicine, and shelter. A plant common to Pacific Northwest coniferous forests, salal grows to about 15 inches in height. Salal features long stalks that contain rows of small pink, urn-shaped flowers. After the flowers fade, edible reddish-blue berries appear. The berries offer an important food source to bears, mice, birds and insects. The area's original inhabitants ate salal leaves to suppress hunger, while the plant itself was an important food source. One of the ingredients used to make root beer, wild sarsaparilla thrives in open shade. Sarsaparilla prefers slightly acidic soil, from which it emerges in April or May. The plant flowers in May through July, with small bluish-black fruits maturing a month later. In September, the leaves start to fall off. The rhizomes are used for root beer. Moose and deer like the leaves in early spring. Bears also search for and eat the fruit. A member of the blackberry family, the thimbleberry thrives along forest edges where it gets the sun it needs to ripen its fruit. Growing up to 5 feet in height, the plant sports large five-point leaves that resemble pale green maple leaves. After the white flowers bloom and fade, dome-shaped edible red fruits appear resembling small raspberries. Native people gathered the berries and spring shoots for food while birds also favor the mature fruits. Reaching just 8 inches in height, bunchberry grows in full- to partially-shaded areas in acidic, well-drained soil. Each plant contains a set of leaves on which a flower consisting of four white bracts appears. After the flowers fade, red fruit appears, a favorite of spruce grouse and vireos. Moose eat the rest of the plant. The fruits also make a tasty jelly. 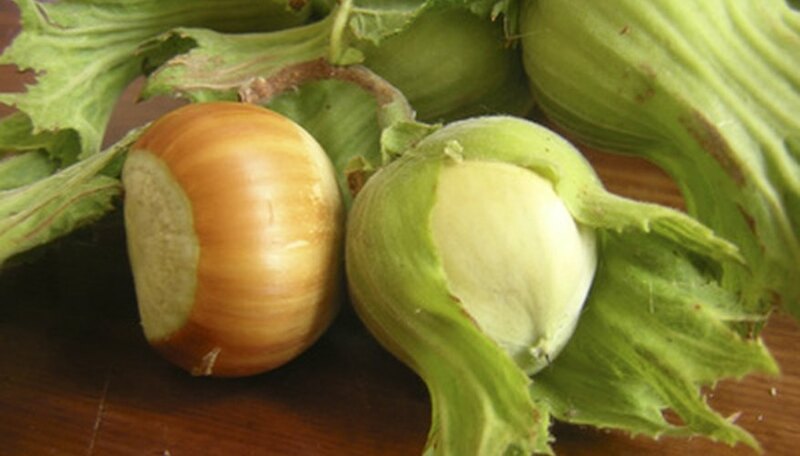 Growing up to 12 feet in height, beaked hazelnut features smooth, hard-shelled nuts encased in green husks. Before the nuts ripen, birds and small mammals pull back the husks and eat the green nuts that appear after the bush’s tiny red flowers fade. The remaining nuts should be collected when the husks start to turn brown, then stored in a dry place until the husks dry for easier removal.